Born in 1963 in New York, lives and works in Paris. Raised in the New York graffiti scene in the 80s JonOne has shown all around Europe. 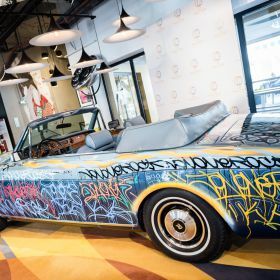 JonOne differs with other graffiti artist in his abstract style, his unique calligraphy but also his talent as a colorist. His works are shown from Milan to shanghai via Paris, Bologna, Los Angeles, Tokyo and New York.